Amazon, B&H, Best Buy, and likely more retailers are now selling the XZ1 for just $599.99. 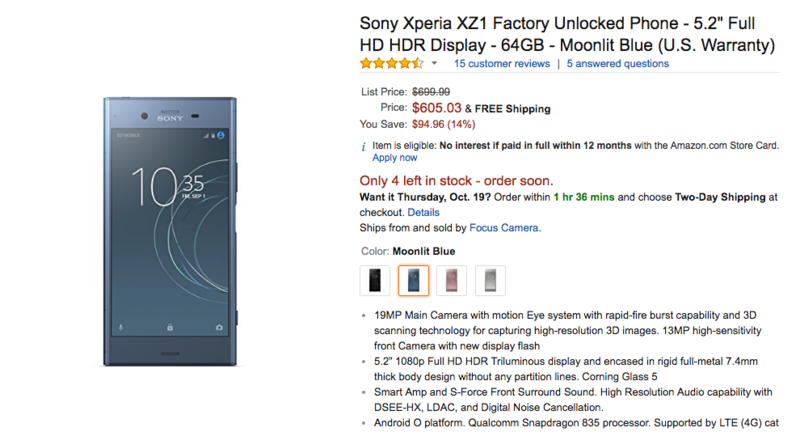 Given the specs, that's really not a bad price at all. Most of you may be under the impression that Google's Pixel 2 and Pixel 2 XL will be the first phones out with Android 8.0 Oreo. But it's not those two, or even the LG V30, that can claim that honor; it's actually Sony's Xperia XZ1. And now, you can grab one of these Oreo-toting phones for just a hair over $605 on Amazon through Focus Camera, with no tax charged unless you're in New York or New Jersey. That's a decent bit lower than the $650 price we spotted a few weeks ago. The Xperia XZ1 sports a 5.2" 1080p HDR display topped with Gorilla Glass 5, a Snapdragon 835, 4GB of RAM, 64GB of storage with microSD expansion, a 19MP main camera, a 13MP selfie shooter, and a 2700mAh battery. Other noteworthy features include a 7.4mm-thin frame, IP68 certification against water and dust, 960fps slow-motion video capture, and dual SIM capabilities. Unfortunately, the US-market phone doesn't get a fingerprint sensor on board. 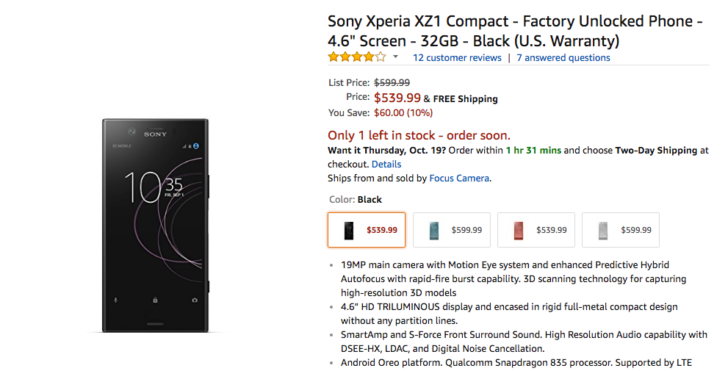 All four colors of the XZ1 are discounted to roughly the same price, with the Moonlit Blue color being the lowest at $605.03 and the Venus Pink the highest at $607.59. And if you'd rather have a 4.6" XZ1 Compact, the black and Twilight Pink colors are only $539.99, also through Focus Camera. The Compacts are almost out of stock, though, so act quickly if you want one of those. Shipping is free, and you don't have to pay tax unless you're in New York or New Jersey. Check the source links below if you'd like to pick one up.